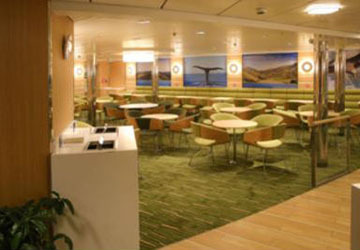 The Kaiarahi has seen major upgrades and passenger area refurbishments in recent years. The vessel can carry up to 550 passengers and contains 1900 metres of vehicle capacity. The ship is spread over nine decks with three open to the public. 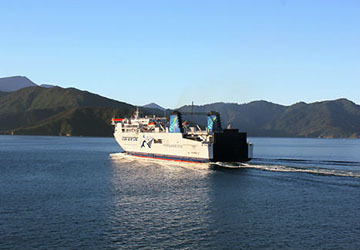 Over the various floors there is plenty to keep voyagers occupied as they cross the picturesque New Zealand waters between the North and South Islands. With renovated passenger lounges and luxurious upgrades to Premium Plus and comfortable cabins, it promises to be a smooth sailing experience for all who make the crossing. 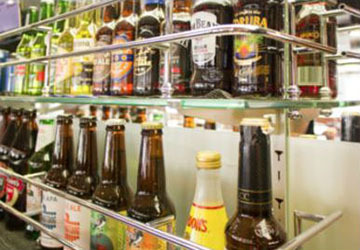 There are a number of different eateries to suit all tastes, a shop to make sure your stocked up on everything for your travels and free WiFi as part of the ticket price. There are a small number of cabins available for passengers, allowing you to arrive at your destination refreshed and relaxed. 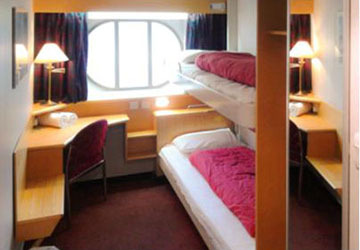 The two berth cabins all have en suite facilities and come serviced with linen towels and soap. Included in the price of cabin hire is a voucher for two complimentary hot drinks and a newspaper. If you want some added comfort but don’t fancy a cabin, you can go for the Kaiarahi Premium Plus option. 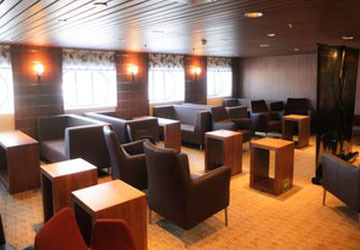 This onboard lounge provides luxurious reclining seating but with added extras such as Sky TV, Newspapers and Magazines and also complimentary food and beverages. Depending on the time of sailing you’ll receive a cooked breakfast or a hot lunch. 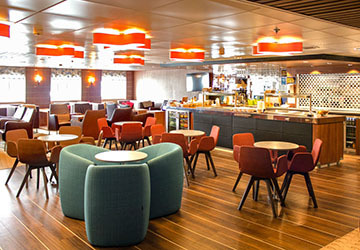 You won’t struggle for food options during your voyage as the ship has a fully stocked food court and café at your disposal, with plenty of seating. The Ocean Eatery provides views of the cerulean waters while you enjoy the delicious local dishes served onboard. 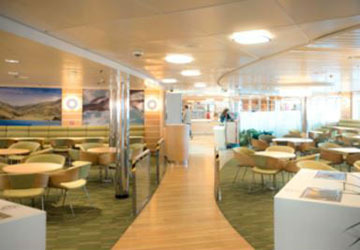 The improved amenities also include a bar to help you while away the hours on your crossing. The Lookout Lounge provides the perfect place to do this, as you can kick back with a drink and admire the stunning views between New Zealand’s magnificent North and South islands. A great range of products are on sale aboard the Kaiarahi. 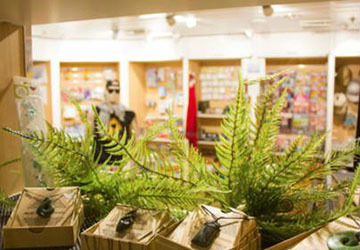 The shop is stocked with souvenirs, newspapers and magazines, sweets and postcards and stamps. There is a Bureau de Change for your last minute currency needs. There’s no need to go hours without contacting family and friends or even fall behind on your work, as the ship comes with complimentary WiFi for all guests. You can enjoy the sun, breeze and spectacular panoramic views from the observation decks. Those travelling with young children have options on the Kaiarahi. A Kids Area and Nursery can be found next to each other on Deck 8, where playing equipment and televisions showing Disney Playhouse Channel are provided. 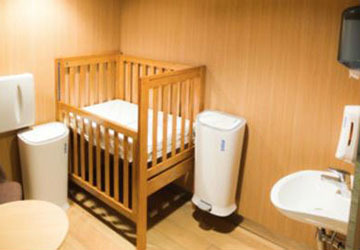 Cots and changing facilities are available in the nursery for babies and infants. The ship has a single lift for non-vehicle passengers and a second wider lift on the Vehicle Deck. Both give full access to Decks 7 and 8 which allows passengers to the lounges, café, bar, food court, family areas, viewing areas and the shop. There are also accessible toilets on both floors. 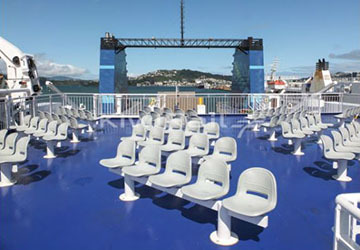 Please Note: Whilst we have taken great care in making our Kaiarahi guide as accurate as possible, onboard facilities, services and entertainment may vary depending on the date and time of year that you travel, facilities mentioned may change without notification and ferry companies reserve the right to operate vessels other than those mentioned at time of booking without prior notification.